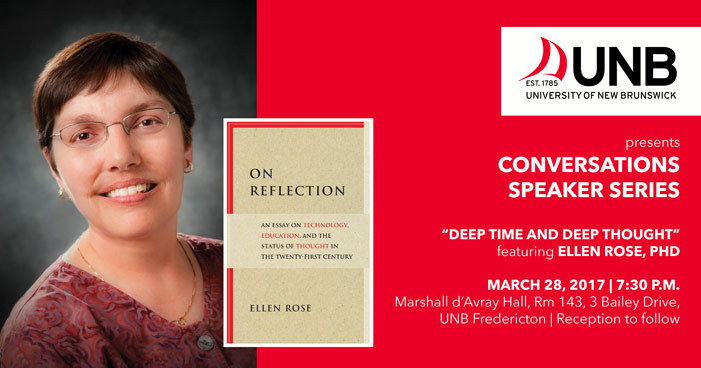 In the third installment of the University of New Brunswick’s Conversations Speaker Series, Dr. Ellen Rose, UNB professor of education, will explore how technology is affecting our ability to manage time and to think clearly. During this interactive event, Dr. Rose will engage the audience with the idea that increases in the amount of information we consume is altering our concept of time, causing us to rush from one moment to the next, and limiting our ability to think critically and reflect on that information. She will also propose that with excessive use of digital devices, time no longer passes but pushes us to move faster. That this can have severe implications not only for our health and happiness, but for our habits of mind. Dr. Rose says that deep thought requires deep time – moments of slowness and stillness that are increasingly difficult to find in a world of multitasking and rapid-fire decision-making. Dr. Rose’s research interests include educational computing and e-learning, instructional design, and the social and cultural implication of media and technology. She previously worked on instructional design in the e-learning industry. Dr. Rose started to see a disconnect between educational technology and learning outcomes. She observed that these tools left limited time for reflection. This led her to return to academia to explore how technology is affecting teaching and learning. The Conversations on Time Speaker Series is a three-part interdisciplinary event. Each speaker is invited to lead a dialogue on this topic from their academic perspective. The first Conversations on Time event took place in November 2016 and was delivered by Dr. Tasneem Husain, a theoretical physicist, writer and educator. She explored how scientists and science fiction writers address the concept of time and how their approaches differ. The second installment, titled History, Process, and Change: Three Questions about Time, was delivered by Dr. Steven Turner, UNB professor emeritus of history, in January 2017. The third and final Conversations Speaker Series event will be delivered on March 28, 2017 at 7:30 p.m., in room 143 of Marshall d’Avray Hall. The Conversations Speakers Series in being presented by the UNB faculties of arts and education. This event is free of charge and the public is invited to attend.